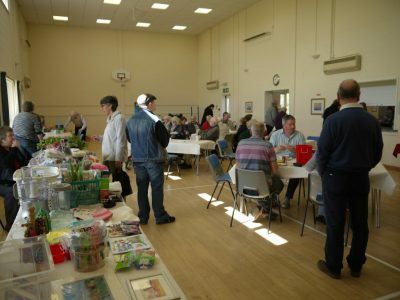 Tibenham Café, a new monthly event, was launched at the end of April at Tibenham Community Hall. It replaces the traditional coffee mornings the hall has held in the past, appealing to a wider community and encouraging more families to come along. An estimated 90 people came through the doors of the café opening; tucking into the good value light lunches on offer, including chilli con carne, broccoli and stilton soup with crusty bread, sandwiches and toasted teacakes. A tasty range of home-baked cakes and sausage rolls were also available to purchase. It’s always great to see friends and neighbours catching up, as well as new faces from outside the village stopping by to say hello. A dedicated “kids corner” has been included at the new café, with colouring, toys, books, craft activities and use of the outdoor play area. Tibenham Cafés are held on the last Saturday of each month, from 11.00am until 2.00pm. All are welcome to come along and are guaranteed a friendly atmosphere. Stalls are just £3 per table – simply turn up on the day. Run by a small, dedicated committee, Tibenham Community Hall holds regular social events, including fitness classes, afternoon clubs, a luncheon club, badminton practice, pamper evenings, bingo and quiz nights – as well as the new Tibenham Café. Volunteers are always needed to help out to ensure events like this can keep happening! For all enquires, please visit www.tibenhamcommunityhall.org or www.facebook.com/TibenhamCommunityHall.